In this day and age of everyone and their brother being on protonix or nexium or some variant thereof, we rarely see patients present with peptic ulcer disease to such a degree that surgical intervention is necessary. The glory days of general surgery had to be back in the late seventies when guys like Phil Donahue MD (not Marlo Thomas' husband) were snipping vagus nerves in a highly selective fashion left and right. The old surgical textbooks had throngs of chapters on all the permutations of ulcer surgery. Vagotomies and Billroth I and Billroth II and roux-en-Y gatrojejunostomies and all the post-gastrectomy complications like dumping syndrome and gastroparesis and roux stasis. My god, I killed myself trying to memorize everything as a junior resident. And then.... I find out no one ever does surgery like that anymore except for the occasional graham patch for a perforated duodenal ulcer. Looking through the old Cameron and Schwartz textbook chapters on peptic ulcer diease is like reading an old scroll from Galen or Hippocrates. Interesting but not particularly relevant to modern surgical practice. But every once in a while we see someone like Patient X. 50 years old, alcoholic, non-compliant with previous medical interventions. He smokes 2 packs a day and said that whenever he would "cough up blood" he could usually treat it by running out to Walgreens and scarfing down a bunch of Tagamet and/or Pepcid. He was admitted for weakness and his hemoglobin in the ER was noted to be 4.6. The upper endoscopy confirmed a large gastric ulcer (3x6cm) on the lesser curve of the stomach that was not actively bleeding. Further questioning found that he had a first degree relative who had died from a "stomach tumor". So he got transfused up to a normal level and was placed on a Protonix IV drip. Then what? Peptic ulcer disease (PUD) encompasses ulcers in two distinct locations: duodenal and gastric. Duodenal ulcers are much more common. 95% of duodenal ulcers are associated with chronic H Pylori infection and nearly all are observed in the setting of acid hypersecretion. Type I- Most common type, usually a single ulcer on the lesser curve, not typically associated with hypersecretion of acid, seen in patients infected with H Pylori or NSAID abusers. Type II- Two ulcers present (duodenal and lesser curve of stomach), strong association with hypersecretion of acid. Type IV- ulcers near the gastroesophageal junction, not associated with acid hypersecretion. 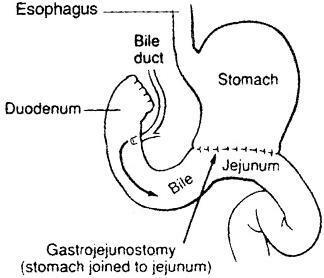 The classic indications for surgery for gastric ulcers are similar to those for duodenal ulcers: perforation, bleeding, obstruction, and intractability. In addition, gastric ulcers are a risk factor for the development of gastric adenocarcinoma. Therefore, all gastric ulcers need to be biopsied and followed over the course of time. Giant gastric ulcers (>3cm) have a 30% incidence of harboring a cancer. Back to my patient. Non compliant borderline alcoholic male. Giant gastric ulcer. Strong family history of stomach cancer. Presents with significant blood loss and massive transfusion requirements....what would you do? Maggie Mahar over at Healthbeat was nice enough to feature a couple of my posts from this past month. Her blog is top notch. Definitely on my short list of med blogs I try to check 5-7 times a week.